Copper stockpiles held in duty-free warehouses in China, the top user, may be re-exported after surging to as much as 350,000 tons from almost none at the start of the year, according to Xi'an Maike Metal International Group. 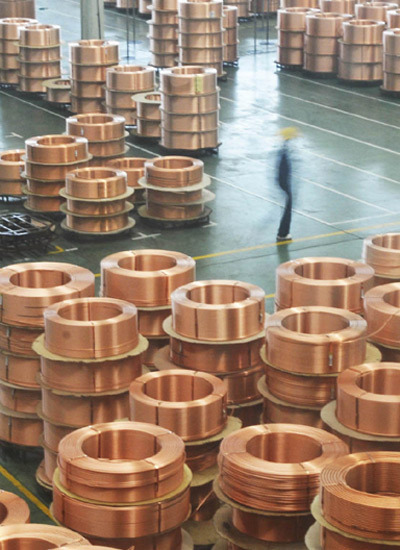 "We can hardly find buyers for refined copper," said Luo Shengzhang, general manager of the copper department at Xi'an Maike. The company ranks among the country's three biggest importers, according to the executive. "China's got to export some copper from now and next year," Luo said in an interview. Copper, used to make pipes and wires, has more than doubled this year as China's 4-trillion-yuan ($586 billion) stimulus spending, increased State stockpiling and lack of scrap material boosted China's imports to a record. That's helped to drive Chinese prices below London's since at least July. Xi'an Maike has had to re-route some bonded copper to London Metal Exchange warehouses in South Korea because the company was unable to find buyers in China, with local supply outpacing demand, said Luo. The effect of the stimulus package was wearing off and local scrap supply was improving, he said. "We do see the trend of more copper being re-routed, though our estimate for bonded copper isn't as big," Grace Qu, an analyst at CRU International Ltd, said from Beijing yesterday. A shift of the metal from bonded stockpiles "to LME reported inventory would be bearish for London prices", she said. Luo's estimate of the bonded-zone stockpiles compares with 60,000 tons by Macquarie Group Ltd in July. It's also more than triple the inventory in Shanghai Futures Exchange warehouses, which stood at 104,275 tons as of the week of Nov 2. A bonded zone holds imported goods before duty has been paid. Three-month copper in London traded yesterday at $6,548 a ton compared with $3,070 at the end of last year. Futures in Shanghai have also more than doubled this year to a high of 51,580 yuan ($7,554) a ton yesterday. Still, buying the metal from overseas to sell in the Chinese market has not been profitable since at least July, according to Bloomberg calculations. Prices in Shanghai were more than 1,300 yuan a ton lower than London on Monday, after accounting for China's 17 percent value added tax. In addition to the bonded-zone stockpiles, China may also hold 150,000 tons in the Shanghai area, including in exchange-monitored warehouses; 235,000 tons at the State Reserve Bureau, which maintains government holdings; and 200,000 tons with fabricators and private investors, Luo, 36, said on Monday. Refined-copper exports by China were 10,705 tons in September, 70 percent more than a month ago and the highest this year, according to data by the Beijing-based Customs office. Refined-copper imports in the first nine months of this year were 2.58 million tons, 165 percent more than a year ago. Xi'an Maike's inbound shipments of refined copper may total about 400,000 tons this year, ranking among the top three importers by volume, according to Luo. The country's imports of refined copper may halve to 1.6 million tons in 2010 from an estimated 3 million tons this year, he said.